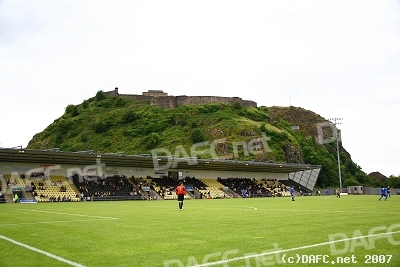 The Pars were again on their travels in preparation for the forthcoming season in Division 1 – this time to another picturesque ground in the venue of Dumbarton. The ground is directly under the shadow of Dumbarton Rock and its one-stand ground contains a very impressive function room which was hosting a wedding reception just minutes after the match! For the Pars though there was no time for sightseeing as the relentless preparation for the season continues. Pars boss Stephen Kenny made 6 changes to the side that started against Brechin on Tuesday night. Young Sean “Mad” Murdoch replaced Roddy McKenzie in goal, and a long-awaited game for defender Jamie Harris who replaced Scott Wilson. 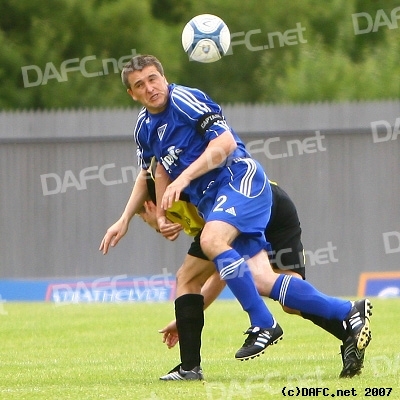 Further changes were made in the form of Scott Muirhead for Greg Shields, Calum Woods for Kevin Harper, Owen Morrison for Stephen Simmons and Jim Hamilton for Mark Burchill. For the first 30 minutes or so the Pars struggled to get to grips with well, anything and the team looked very disjointed. Most of the play seemed to come from the left side as for some reason or another the ball was rarely passed to Calum Woods (left) when he found space and time on the right-flank in an unfamiliar position. 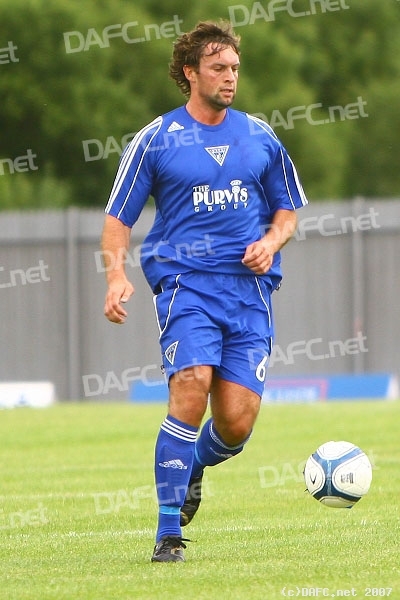 Owen Morrison on the left flank was caught on several occasions in an offside position when the ball was played and that contributed to the Pars losing possession several times. New-start Jamie Harris (right) is a big lad and has presence in the centre of defence, good in the air but does look awkward at times (perhaps to him being out for so long perhaps). 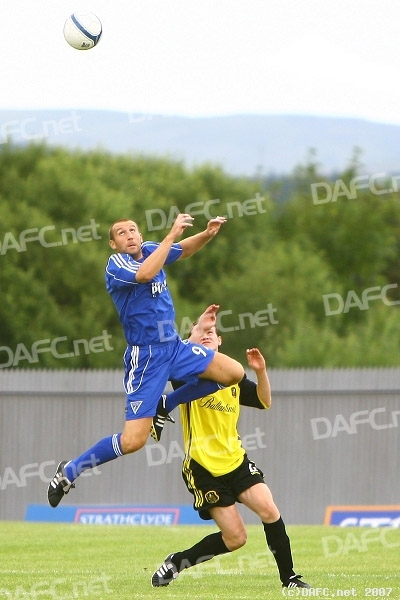 More often than not the defence were getting caught out with the Dumbarton strikers running in behind the centre-halves, and this cumulated in Dumbarton opening the scoring on the 11th minute through DAVID McFARLANE doing just that. Score 1-0. 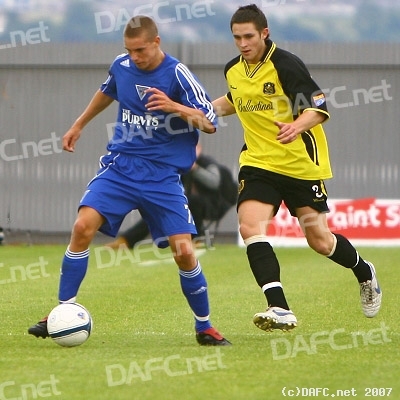 The Pars equalised on the 34th minute when a Scott Muirhead cross from the left was met by the head of Jim Hamilton powerfully and the Dumbarton keeper could only parry it into the path of SCOTT THOMSON to slot home the re-bound and score for the first time since 23rd October 2004 against Partick Thistle in the CIS Cup! Score 1-1. Two minutes before the break Jim Hamilton was again provider to STEVIE CRAWFORD to clinically slot the ball to the far-post from 15 yards on the right-hand side of the penalty area. Half-time 1-2. Stevie Crawford celebrates with Calum Woods. Second half saw the Pars emerge with 3 changes. Nick Phinn came on for Calum Woods, Stephen Simmons replaced Stephen Glass and Greg Shields came on for Jamie Harris with Scott Thomson shifting into the centre-half slot.